The CGOA’s Warm Up America Challenge is complete! While we didn’t win the prize for the most blocks made, we did help CGOA make an impressive number of blocks for charity. It is time for us to assemble the blocks we made for the Challenge. We’ve selected HugCrafters as our charity and will be assembling blankets for Spaulding Rehab. We will be making lapghans for folks in wheel chairs. HugCrafters’ guideline is to make wool-free blankets that are approximately 3′ x 4′. Square is OK, but this rectangular size is more practical. 20 of our WUA blocks will make a 3′ square blanket, 25 blocks will make a 3′ x 4′ blanket. Mary will bring the blocks we’ve been collecting so anyone who wants to help assemble blankets can pick thru and choose their colors. She will also bring some black acrylic yarn to share for assembly. If you have made any additional blocks, or have acrylic yarn of any color you’d like to donate to the project, please bring to the meeting. Karen, Mary, Barbara, and Melissa went to the CGOA Chain Link conference this year in Illinois. Karen, Mary, and Melissa will be on hand to share some tidbits and exciting news from our travels. We came home with lots of ideas to help grow our membership and make our meetings more fun and interesting, but we’ll need everyone’s help to choose and implement these ideas. Additional crocheted blocks, if you have them. If you’d like, any color of acrylic yarn you’d like to donate to the project. This yarn will be used for joining, boarders, or filling in additional blocks to make complete blankets. Any other completed charity items you’ve been working on. The Fishnet Crocheters along with many other chapters participated in the CGOA Warm Up America Challenge this year. We were tasked with making as many 7″ x 9″ blocks (per the Warm Up America guidelines) as we could between January 3rd, when the content was announced & July 1st, just in time for winners to be announced at Chain Link. Each chapter competed for prizes. The chapters with the highest average blocks per member won prizes. Red Heart sponsored cash prizes for each winning chapter which were awarded at the conference at the Excellence in Crochet event. Fishnet Crocheters of New England did NOT win the prize for the most blocks made for Warm Up America, but Red Heart, as a sponsor, awarded each participating chapter with some yarn to help make more blankets. Participating CGOA chapters made a total of 8,970 blocks, if you can picture that. The winning chapter, AStitch4You from Evarts, Kentucky, has only five members, who made a total of 716 blocks. Hard to compete with numbers like that! Dona Cerule busily taking inventory of the completed blocks for the Warm Up America Challenge. Due to the volume CGOA anticipated, we were asked not to use Warm Up America as an intermediary, but to choose a charity and assemble the blocks into blankets ourselves. At one of our summer meetings, we selected HugCrafters as our charity and will be assembling blankets for Spaulding Rehab. We will be making lapghans for folks in wheel chairs. It is time for us to assemble the blocks we made for the Challenge. HugCrafters’ guideline is to make wool-free blankets that are approximately 3′ x 4′. Square is OK, but this rectangular size is more practical. 20 of our WUA blocks will make a 3′ square blanket, 25 blocks will make a 3′ x 4′ blanket. Mary will bring the blocks we’ve been collecting to the August Meeting so anyone who wants to help assemble blankets can pick through and choose their colors. She will also bring some black acrylic yarn to share for assembly. If you have made any additional blocks, or have acrylic yarn of any color you’d like to donate to the project, please bring them to the August meeting. This yarn will be used for joining, boarders, or filling in additional blocks to make complete blankets. We are supporting some additional charities! lap robes of approximately 42” square. Some upcoming crochet events you may be interested in! There may be additional details on some of these events on the Events of Interest page. Several Fishnet Crocheters are working on their Sabrina Tunic. Join in! Around the Bases CAL. 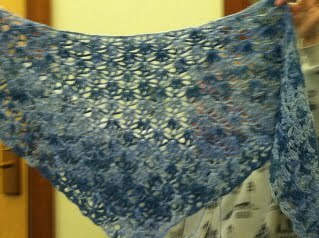 Several Fishnet Crocheters are working on this CAL. Free pattern on Ravelry and Rav group for extra help. Mystery Amigurumi CAL with the Crochet Crowd, starts September 8. Creative Arts building and The Fiber Nook (in the livestock area). The Greater Boston Yarn Crawl Crochet “Freedom Trail” shawlette for the event: available on Ravelry. Caring Forest Installation a yarn storm event sponsored by the Nave Gallery to raise awareness for Somerville’s homeless population. Workshops October 15-18. Buses from Webs ; Assabet After Dark ; The Eliot School. Other transportation options. Virtual event on Facebook, Twitter, Instagram and Pinterest; Using hashtags #stitchitforward and #ilyd2015. “Wonder of Wool” exhibit at the American Textile History Museum in Lowell, MA through December 31, 2015. Coupon for $2 off admission on their website. Stitch Away Stress Lemon Stress Ball Drive. Crochet a lemon by Dec 31 for it to be distributed on tax day in NYC to promote crochet as a stress reliever. Our last meeting before the start of the summer season was held a week early due to the upcoming Memorial day weekend. Show and tell included lots of fun projects and patterns. Some of our folks had gone to the NH Sheep and Wool Festival the previous weekend. Despite the rainy start, it turned out to be a fabulous day! Lots of goodies were procured in addition to some fun time chatting over lunch (lobster rolls -yum). After show and tell, we joined in a Spring Cleaning Swap Meet. 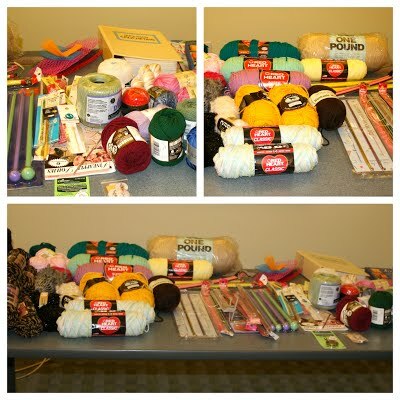 Crocheters brought in no longer used or needed yarns, tools, and patterns. Everyone had a chance to find something of interest. Anything left was packed up to donate to Warmer Winters for their use. Blue & gold scarves were collected for the Old South Church Marathon Scarves project. Scarves will be distributed to Boston Marathon runners by Old South Church during the annual Blessing of the Runners service. We’ve adopted Warmer Winters as our pet charity for the year. 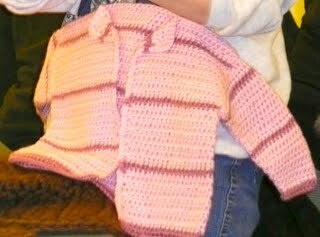 Warmer Winters is a charity in central Massachusetts that donates handmade knit & crocheted items to those in need. They also teach knitting to elderly & children. They accept washable handmade items for winter. Everything is needed – scarves, hats, mittens, sweaters – all sizes – all colors. However, they also accept monetary donations, yarn donations, and craft donations for their fundraisers (which in turn they use to purchase yarn). Pat will be collecting items the Fishnet Crocheters meetings and making sure they get to Warmer Winters. Oddball Baby blankets are blankets crocheted in six 6-inch strips round-robin style. At each meeting, we rotate the blankets so that another 6-inch strip can be added. Completed blankets measure about 30″ x 36″. To participate, come to a meeting and take home a project. Or start one at home by crocheting a 30″ x 6″ strip using any worsted weight acrylic yarn and any stitch. Bring it to a meeting to hand off to someone else. 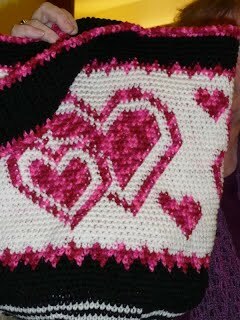 Nancy w ill be collecting blankets the Fishnet Crocheters meetings. Blankets are sent out to charity recipients as they are completed, with a few already going to benefit Hurricane Sandy victims. Many thanks to Fishnet Karen for leading us in a demonstration of linked stitches. 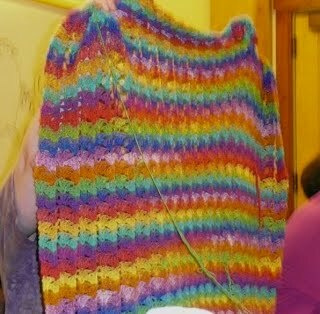 Charity items were collected to be distributed in time for Mother’s Day, including this shawl.